There are three ways to transfer the proceeds of an death benefit to the beneficiaries. It can be done thru’ wills, irrevocable nomination & revocable nomination. The method of nomination is more cost effective than having a will. My Muslim friends and clients had always face an ‘hidden risk’ when it comes to estate distribution especially on insurance. They had assumed ,if no nomination was made, the spouse and children will get the proceeds for the insurance policy since it was purchased for the benefit of the immediate family members. However, under the estate distribution as dictated by Syriah law , it is highly possible that the majority of the proceeds end up with the deceased’s male siblings and children, leaving very little to the distraughted wife. Likewise, under Syriah law, there is only a small percentage of an Muslim’s assets that can be willed under the common law. 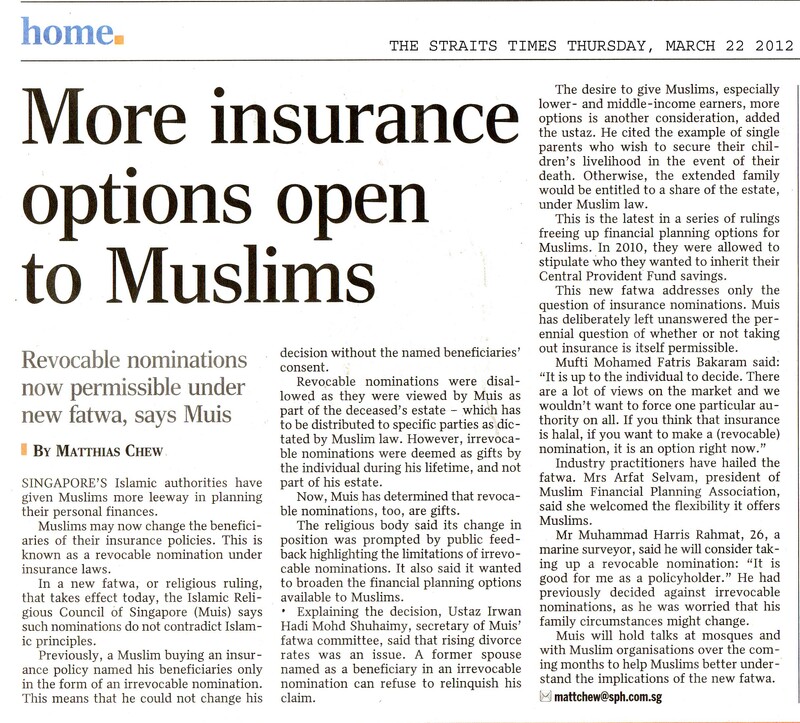 A non-Muslim can choose to nominate his/her beneficiaries under revocable nomination. The advantage of this nomination is the nominee/beneficiary can be change as many time as the policy holder wishes to change. However, a Muslim cannot do that and can only make an irrevocable nomination. The problem with the irrevocable nomination arises when a divorce take place. The former spouse can choose not to give up his/her right as an nominee and there is nothing the policy holder can do. A new fatwa takes effect on 22nd March 2012. It allows Muslim to nominate under revocable nomination. But for those who had already nominated their spouse as beneficiary still face an uphill task if they want to change it to revocable now. They will need to spend sometime explaining to their spouse that they have to give up their rights before they can nominate under revocable nomination. A detail report is shown below and for those who wish to know more about revocable & irrevocable nomination can read my previous post. Feel free to share this with your friends and drop me a mail if you need any info.